Kahili ginger is probably one of the first plants that catches your eye if you are visiting Volcano Village or the Hawaii Volcanoes National Park. It can grow up to two meters tall and has yellow or red very fragrant flowers. The ginger plants dominate the understory layer of the rainforest at these elevations and are difficult to miss. Kahili ginger is considered as an invasive species (more below), but it makes an unforgettable impression if you are lucky enough to smell some of its flowers. 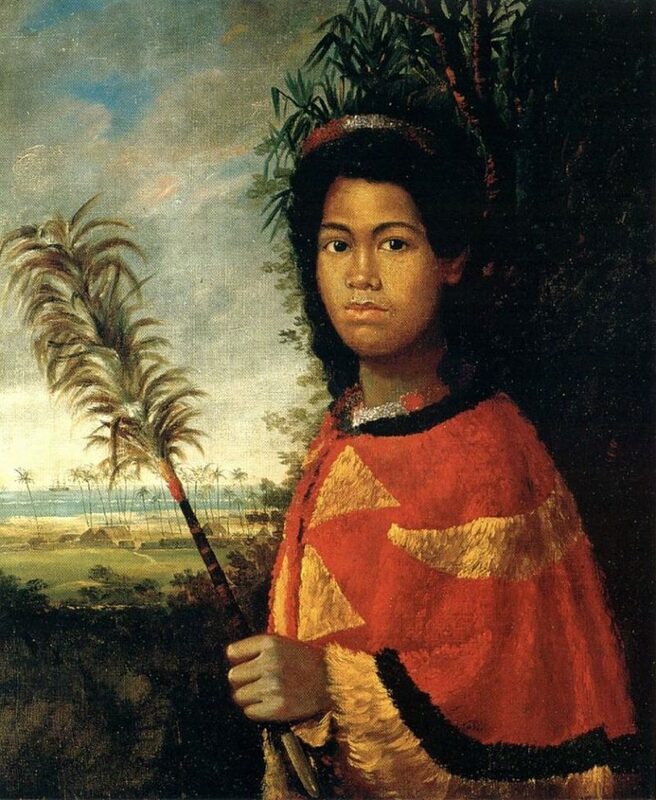 Why is it called ‘Kahili’? How did Kahili ginger get its name? ‘kāhili‘ is a Hawaiian word that is used for a feather standard or a long pole decorated at one end with a cluster of feather plumes. The plants were named so for their resemblance to this Hawaiian symbol of royalty which was used as a ceremonial emblem and indication of lineage. 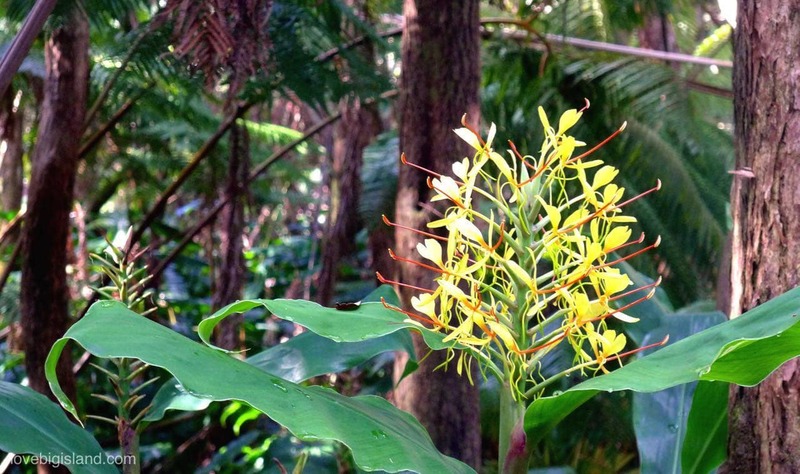 The scientific name for Kahili ginger is ‘Hedychium gardnerianum’. Other names used to describe this plant are e.g. wild ginger, ginger lily and fragrant ginger lily. Kahili ginger was introduced to the Hawaiian islands from eastern India because of its ornamental value early in the 19th century. Soon, however, it proved to be more trouble that anticipated because of its exceptional adaptation to the local conditions. 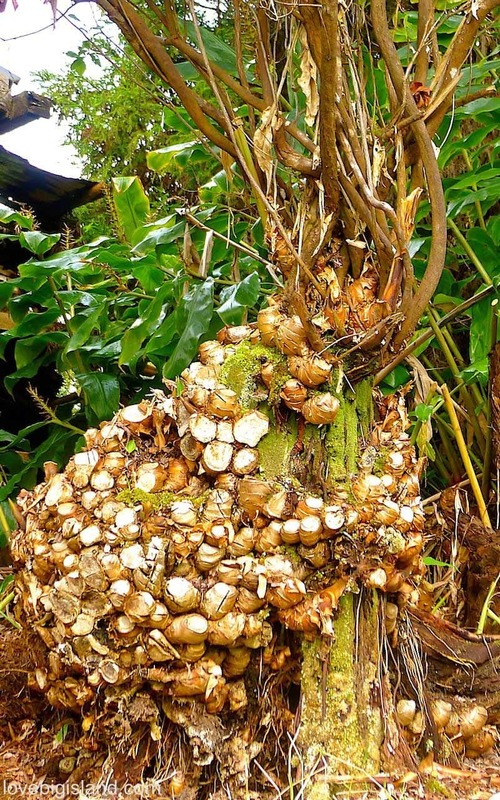 Today kahili ginger is considered an invasive species in Hawaii and it even made it to the ISSG list of 100 worst invasive species if the world. 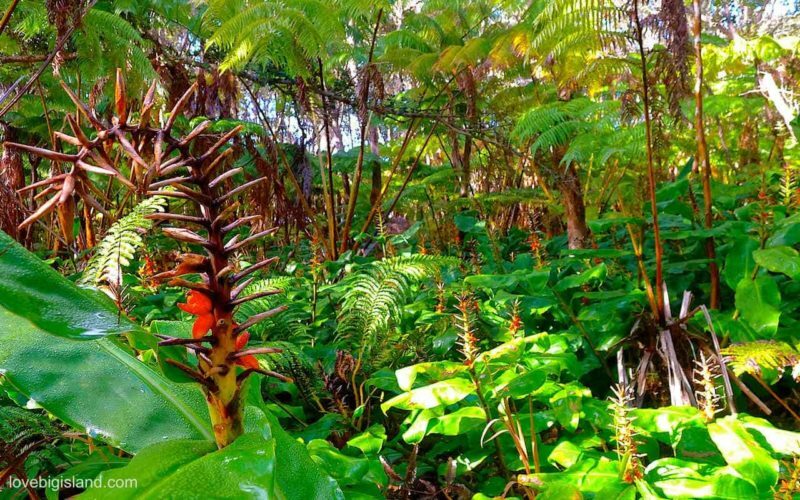 The ginger displaces native plants, forms vast, dense colonies and chokes the understory vegetation. Kahili ginger is not only a problem in Hawaii but also in forests in e.g. the Federated States of Micronesia, Cook Islands, French Polynesia, Hawaii, New Zealand, La Réunion, South Africa and Jamaica. The flowers of Kahili ginger are very fragrant and large. They can grow up to ~a foot tall (between 25 and 40 cm) and have pale yellow and red flowers. These flowers only last for a week, after which 0.5 – 2 cm long orange fruits appear. If you do see one of these flowers during your stay in Hawaii, try to smell it. Their scent is unforgettable. Kahili ginger in Hawaii is seasonal. Its flowering season starts late summer in august and continues deep into the fall. Kahili ginger flowers can grow up to one feet tall and are very fragrant. Many people think that the roots of this plant are edible when they first see them. Please don’t try them! Kahili ginger is not edible. The roots do resemble the edible ginger that you probably know (Zingiber officinale) but are larger, and the plant belongs to the same family. That is where the comparison stops. The value of Kahili ginger is ornamental, not nutritional. We will leave you with a picture that shows “ginger gone wild” over a tree in volcano village. It’s rhizomes (underground stems of the plant, root stalks) grow abundantly and can even cover (parts of) trees. Here you see the rhizomes of one Kahili ginger plant still covered in the machete marks from attempts to remove it.